KICKER began as a two-person operation back in 1973, producing hand-built audio systems for cars and trucks. Luckily for the automotively challenged, the company has expanded to include home and personal audio products built with the same dedication to technology and performance. 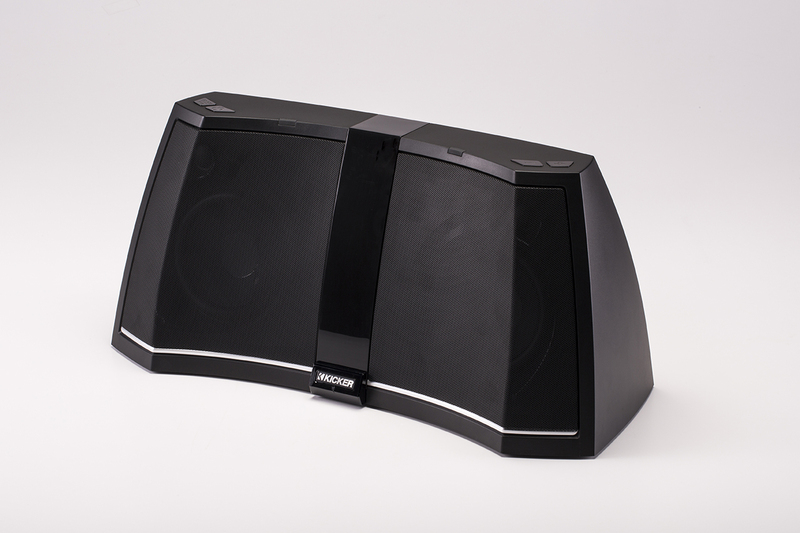 Looking for a Bluetooth speaker system with kick? How about a cool set of really comfortable headphones? We review the KICKER Amphitheater BT2 Speaker System with Bluetooth and KICKER Vapor Headphones, which bring their audio expertise into your home and on the road. The primary difference between the BT2 and more typical Bluetooth audio systems is that the KICKER product is designed to stay put. It doesn’t have batteries, so don’t expect to plunk it down on your beach towel while you and your surfboard wait for the right break. Instead, the BT2 needs to plug into an AC jack so, although it is quite portable and perfect to bring to parties, use at the pool, or in the house or dorm room, so be sure you have an outlet for it. This isn’t a drawback, since we expect to have to make a compromise or two with any portable audio unit. The speaker elements tend to have lighter-weight magnets, limiting bass excursion and accuracy. They often use a single all-purpose speaker, rather than separate elements for mid-tones and high frequencies. KICKER’s goal was superior audio, and the BT2 delivered. It is equipped with a 6x6-inch reflex subwoofer, dual 5-inch woofers, and dual ¾-inch silk dome fabric tweeters, powered by a 50-watt amp with a DSP (digital signal processor). All this adds up to a rich, seamless sound that’s at home pumping out bass in any music genre from heavy metal to jazz. KickStart is a free app available for either Android or the iOS, and allows the user to update firmware, set and save precise EQ presets, and control volume. It worked well, and allowed us to stream music from our Virgin Samsung Galaxy phones and ipad, and to tweak the sound. The BT2 comes with a small and solid remote control, but we imagine that many folks will simply use their phones or tablets to drive the unit. The build quality is exemplary, and it is very easy to use. It has a convenient USB port for charging and powering your device. The system is compact and fits nicely on a table or desk. We found that with the rear-mounted passive radiator subwoofer, it’s best to position it at least 6-8 inches from a wall. It can seriously pack a punch, and stays admirably clear at higher volumes, so much so that as I cranked it higher and higher, not only did it stay clear of distortion, but also it was so loud that it emptied the room of visitors! It definitely has the capability to power many a crowded party. For a small, affordable system, it’s highly effective, and I can’t imagine that many people would actually need to push it as loud as it can go. It also looks quite handsome, with a jet-black finish, a gratifying heft and weight. The only feature I’d love to see added is the AptX codec for even higher quality sound. When I compared the Bluetooth audio to the audio when I used the optional accessory jack, the direct wire approach resulted in higher quality, which would be ameliorated by using either AptX or Apple AirPlay to overcome the audio limitations of the Bluetooth protocol. Bluetooth audio has well-known audio limitations, and it would have been great if the AptX codec could have been included. That addition could provide Bluetooth audio users with dramatically upgraded audio quality, invisibly to the users. We are happy to see KICKER enter the home audio market, and predict that the KICKER Amphitheater BT2 Speaker System will be a hit for folks seeking a system capable of shaking the walls, yet equally at home reproducing the nuances of lighter musical choices. We also tested the KICKER Vapor headphones, a wired solution that proved very comfortable and light on the head, with a solid bass kick, and attractive tangle-free cords. My son Jonathan tested them with music, gaming, and videos and felt they were natural sounding, fit great, had a nice sense of bass without the obvious thumping of other youth oriented models. He also liked the black and yellow styling, microphone, and in-line cord multi-function remote. He gave them a “thumbs up” – high praise from a demanding teenager!